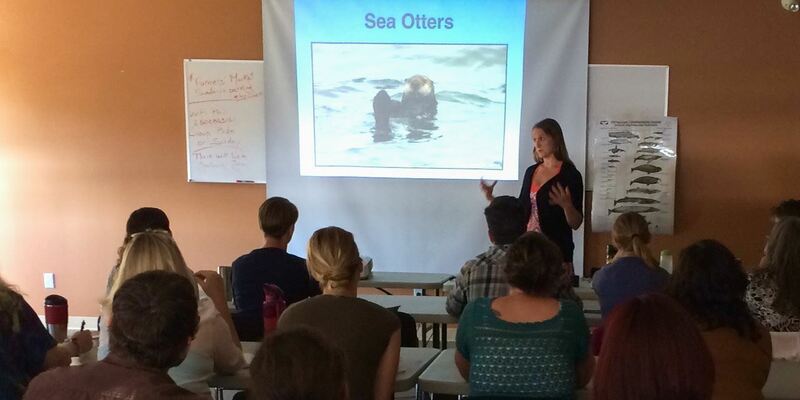 Marine Education and Research Society workshop on BC's whale species and seals, sea lions, dolphins, porpoises and otters too! Intensive training for those working (or hoping to work) as whale watch naturalists, kayak guides, park staff, or others interested in gaining a deeper knowledge of the natural history and conservation of BC's marine mammals. Bring sharp pencils and lots of notepaper! A certificate of participation* will be provided to those who attend the full 3-day workshop. Aim of the workshop is to enable more people to inform and inspire marine mammal conservation. Cost is $300 per person and, a spot was secured with at $200 deposit (non-refundable). Final payment of $100 was due March 1st. 621 Island Highway - Thulin Room. If you have any questions, please contact info@mersociety.org. *Regarding certificates: North Island College students and some participating kayak guides will also undergo a written test. Optional activity for Campbell River: Dinner - details will be emailed. Join us May 10th for a presentation on Humpback Whales by Marine Education and Research Society (MERS) researcher Jackie Hildering. MERS is based on NE Vancouver Island with education efforts being coast-wide. 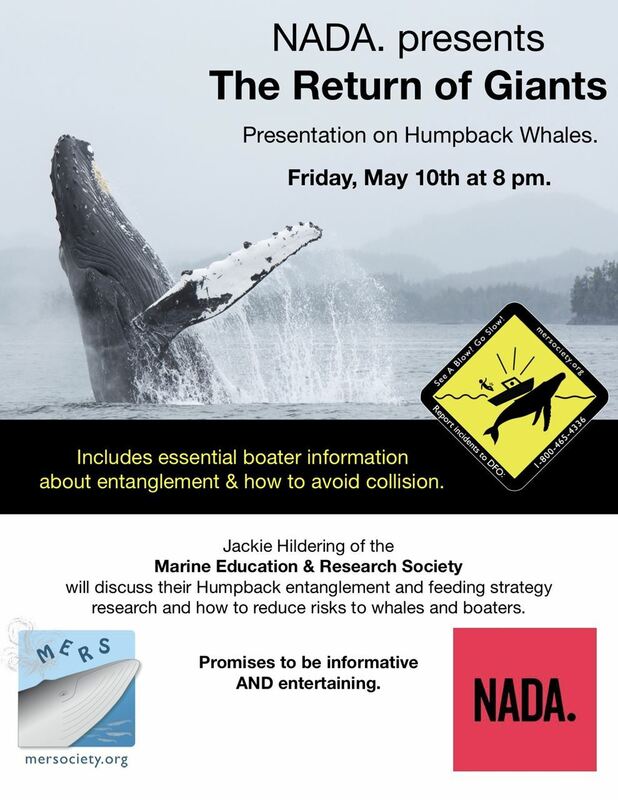 In addition to sharing MERS’ research on Humpback feeding strategies and rate of entanglement, Jackie will discuss how the fortunate return of these giants from the brink of extinction necessitates increased boater awareness about avoiding collision, what to do if entanglement is witnessed, and the value of reporting incidents of disturbance. Marine Education and Research Society research includes having documented a novel feeding behaviour of Humpbacks dubbed “trap-feeding” and determining that 50% of Humpbacks feeding off the coast of BC have entanglement scarring. As an educator, cold water diver and underwater photographer, she is known as “The Marine Detective” with on-camera experience including being featured on Animal Planet’s “Wild Obsession” series and in the BBC productions “New threat to Canada's Pacific Humpback Whales?” and “Ingenious Animals”. She has been awarded the Vancouver Aquarium’s MAN Award for Excellence in Aquatic Education (2010) and has been referenced as the standup comic of marine conservation. Cost: $300 per person. A spot was secured with at $200 deposit (non-refundable). Final payment of $100 was due March 1st. Location: Location: Gatehouse Theatre, 1705 Campbell Way. North Island College students and some participating kayak guides will also undergo a written test. Optional activity for Port McNeill: Dinner - details will be emailed. Come join the MERS team and other workshop participants for an evening of food and mingling at the Sportsman Restaurant, 1547 Beach Dr, Port McNeill. The event starts at 6:30pm on Saturday June 1st, after the second workshop day. The cost of $30.50 per person includes tax and gratuity for a buffet dinner. Drinks are not included. Reserve your spot now, as space is limited. The buffet will include salad, dessert and chicken or beef (for non-vegetarians) and spinach lasagna (for vegetarians).